We shall soon be uploading some guided mediations that are channelled to Roshani, from Higher Beings. These will be short and quick Meditations for everyday use that will help you move towards choosing Your Path Ahead & manifesting an abundant, joyful & healthful Life. Stay Tuned for the Announcement. Roshani Shenazz conducts Monthly Meditations in Mumbai and during her Traveling Workshops. 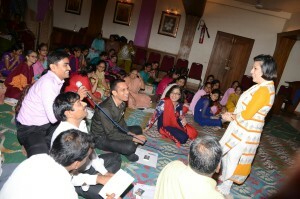 She also conducts Guided Meditations for Corporate / Organizational seminars, workshops, evenings, meets and other gatherings. They are highly powerful and have created immense transformations and healing in the past. Most of the Meditations are for 45 minutes to an hour while some are for 30 minutes. We have the shorter 15 to 20 minutes © Guided Meditations for the fast paced lives that we have.